Our tutorial number 2 was great! We really enjoyed it and we hope you did too. But if you couldn't attend it, we also thought about you so we recapped the best of the Webinar in this post. And the most important, we recorded our Lander Academy so you can watch it whenever you want! 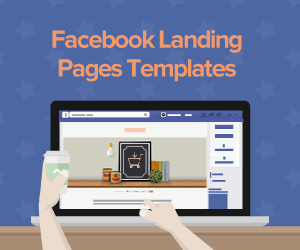 This last Free Lander Tutorial about how to get the most of your Landing Page was divided in three different parts. First we did a Landing Pages overview, so if you had any doubts about them, such as its functions, or the importance for your marketing campaign, now you’re gonna learn why Landing Pages are a must for your Business’ goals. After that our Account Manager Eric Pfeiffer showed us how to use Lander, how to create a Landing Page, how the Editor works, its integrations, etc. And as a Bonus tip, he also explained the most 5 common mistakes that crush your Landing Pages conversions, so tighten your belt and enjoy our Lander Academy Tutorial! Why Landing Page are so important? Well do you know that after clicking a link from a search engine or pay-per-click ad, visitors look for instant gratification? So if they don’t find what they’re looking for in just a few seconds they will hit the “back” button, even if the item they were looking for was on the page. 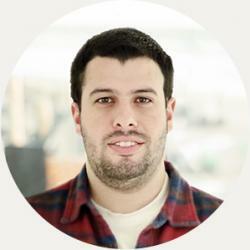 Landing pages, as Conversion Scientist Brian Massey States, are “conversion beacons". They help the impatient website visitor hone in on exactly what she wants by providing clear navigation and instructions. What is important here is that a Landing Page, is really useful when you’re looking for a specific action, only one action. That means that when you’re building a landing page, you need to think on a specific goal and ask your visitor just for one and only action. What does it mean? Well that means that you’re losing conversions, but why? Because when you direct your visitors to your homepage you increase the chances to lose them, because they have some many options to do, and if they don’t find the benefit or the specific action they’re looking for, you will lost them. So you have to think about your visitor, send them to a specific Landing Page if you want to achieve your goals. Reducing confusion so your visitors can make quick decisions in your favor. Showing your visitors with tunnel vision find what they’re looking for instead of missing something because it’s in the wrong place. Helping scanners understand what the page is about by providing short, crisp, bold copy, attractive graphics and direct calls-to-action. Giving your visitors what they want, and direct them to do what you want them to do. Now that you know why a Landing Page is so important, and how you can use it for your Campaign, lets see how Lander can help you. First our Account Manager explained how to use the Editor, he showed us how easy is to edit your Landing Page with our Drag and Drop, and how to create CTAs and forms just in seconds and how to include them in your landing page in seconds. 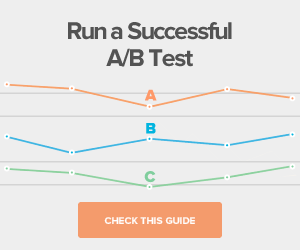 Also in this Lander Academy you learned how to run A/B Tests and optimize for better conversions. But let’s see the Webinar talk by itself, watch it here! 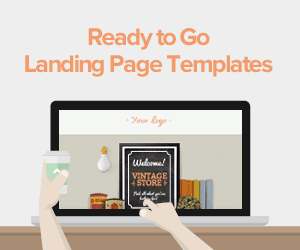 So you know why use Landing Pages, and how to build them. Now it’s time to learn some good tips, about common mistakes that crushed your Landing Pages Conversions. Keep this tips always in mind when you’re building your Landing Pages because this can make the difference between a rockstar Landing Page and very sad one. Blowing the headline: The first thing your visitors are gonna see in your Landing Page is your headline, so take all the time you need to think a headline that make the visitors stay and convert! Asking for more than one thing: Sometimes we heard that is better to give your visitors many options, so they can choose whatever they want. Well when you’re building Landing Pages that concept couldn't be more wrong! As we said before you have to ask for just one and specific action to your visitor. Ignoring basic aesthetics: When you’re designing your Landing Page think about your audience, use the fronts, colors and visual that are tailored with them and with the action you desire. Having the call-to-action below the page fold: Do you know that only the half of the people that land on your page is gonna see below the page fold? What that is means? You need to focus on the most important information up the page fold, for example never include your Call to Action below the page fold. Not targeting the landing page directly to your intended audience: Your Landing Page must focus on your audience, you need to customize and personalize your content. Never choose a general message because you’re gonna lose your audience's interests. Try to think as your audience would and design the landing page to capture their attention and to convince them to take an action. We hope you enjoyed our Lander Academy, if you have doubts, or you want to see something different in our next Lander Tutorial please write us, or let us a comment here! 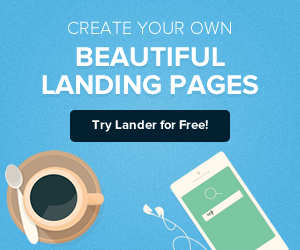 If you want to start building landing pages create your account in Lander for free, and see how easy can be!